Quick Definition: An economic system is the way the government of a country organises the production and consumption of goods and services in the economy. An economic system is the system the government of a country uses to manage its economy. An economic system decides what goods and services are produced and consumed in an economy and how many goods and services are produced and consumed. An economic system will also decide how goods and services are distributed to the population. Free market economy – This is system where all economic activity is directed by private individuals and organisation and there is no, or little, intervention from the government. 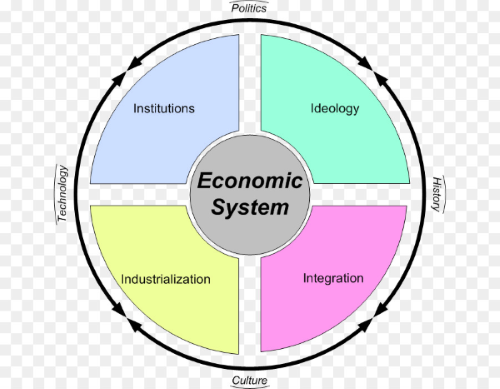 Command/centrally planned economy – This is a system where the economy is controlled by the government and it decides what and how things are produced and how goods and services are allocated to the population. Mixed economy – This is the most common type of economic system. It is a mixture of a command and free market economy. There will be areas of the economy that are controlled by the government but there will be also areas that are left to private individuals and organisations. Transitional economy – This is when the economic system in a country is moving from one type to another. For example, the government may decide to free up some areas of the economy so they are produced by private individuals and firms rather than the state.